“Hey, did you ever hear of the Iowa Butter Gang?” It’s the last question I expected to hear during my recent “Culinary History of Iowa” book signing in West Des Moines, and it definitely caught my attention. It came from Jan Kaiser, a former Des Moines librarian who had first “encountered” the nefarious gang a few years ago through research into 70+-year old newspaper archives. Turns out that crime came in many forms during the Great Depression. Back then, butter was big business in rural Iowa. Not only was Iowa a leading dairy state, but hundreds of Iowa creameries produced high-quality butter that helped make Iowa a top shipper of butter into the New York City area, I learned recently from Iowa Secretary of Agriculture Bill Northey. The article noted that during the spring and summer of 1936, a new “racket” had sprung up in Iowa in the form of an organized gang that preyed on creameries throughout the state. By early August 1936, more than 20 tons of butter had been stolen from 17 Iowa creameries since early April 1936. “The loot taken so far is estimated to total more than 20 tons and is valued at $15,000,” noted the news article. Butter making was big business in small-town creameries across Iowa in the 1930s, including this creamery in Somers (featured in my Calhoun County book). George Smith built Somers’ first creamery was built in 1900. In 1913 S. P. Petersen purchased and updated the creamery, which became a major business in town for many years. The round tubs in this photo each held 65 pounds of butter. This butter was sold to area stores. In Fort Dodge alone, about 2 tons of butter was sold each week. Butter from Somers was also sent to New York. The writer speculated that the gang must have a central warehouse, since butter is highly perishable. The apparent racket reached such epic proportions that Iowa Department of Justice officials concentrated their efforts to apprehend the gang. “Officers believe this ‘hot butter’ is peddled through a ‘fence’ in some large city, possibly Chicago or Omaha,” the writer noted. It’s no wonder locals were keeping a close watch. The Farmers Co-op Creamery shipped thousands of dollars of butter each year to the New York market. The Adams County Free Press reported that two local truck drivers would each take eight-hour driving shifts and drive straight through from Iowa to New York. The best time they made from Iowa to New York was 64 hours, although the trip usually took 65 to 70 hours. About 200 pounds of dry ice were used for refrigeration during the trip. On the return trip, the drivers hauled any kind of freight they were able to pick up. In 1935, the Corning creamery shipped 985,000 pounds of butter, noted the newspaper article. Due to the harsh winter and summer drought of 1936, however, that year’s production was expected to fall far below average—a fact that made the butter robberies of 1936 even more devastating in rural Iowa. By August 1936, officers with the Iowa State Patrol (formed just a year earlier in 1935) and a group of northern Iowa vigilantes and deputy sheriffs had been driving the secondary and dirt roads nightly for the last two months, trying to catch the butter gang, according to the Des Moines Tribune (the capital city’s afternoon newspaper that ended in 1982). Some promising leads ended in disappointment. In the summer of 1936, officers arrested Harvey Mighell of Holstein on suspicion that he was connected with the butter gang. He was taken to Audubon, where he was questioned and later released under $2,000 bond. Mighell denied having anything to do with the Iowa butter thefts. Turns out an Omaha gang of six men and one woman stole some $30,000 worth of butter, cheese and eggs in a string of more than 30 robberies across Iowa in 1936. (The pilfered dairy products were worth nearly $525,000 in today’s money.) The butter was trucked to Omaha and was sold through a fence. “Virtually every sheriff in northern Iowa has been on the case as well as several detectives of the Omaha police department and other Iowa town police departments,” the reporter noted. Iowa prosecutors charged the gang with 32 robberies. Detectives recovered 70 tubs of butter, the Tribune reported, 66 of which had been stolen from a creamery in Wesley. All the cheese was lifted from Ionia, the story reported. Law enforcement officials took the dairy products and sold them through legitimate channels to packers in Omaha. 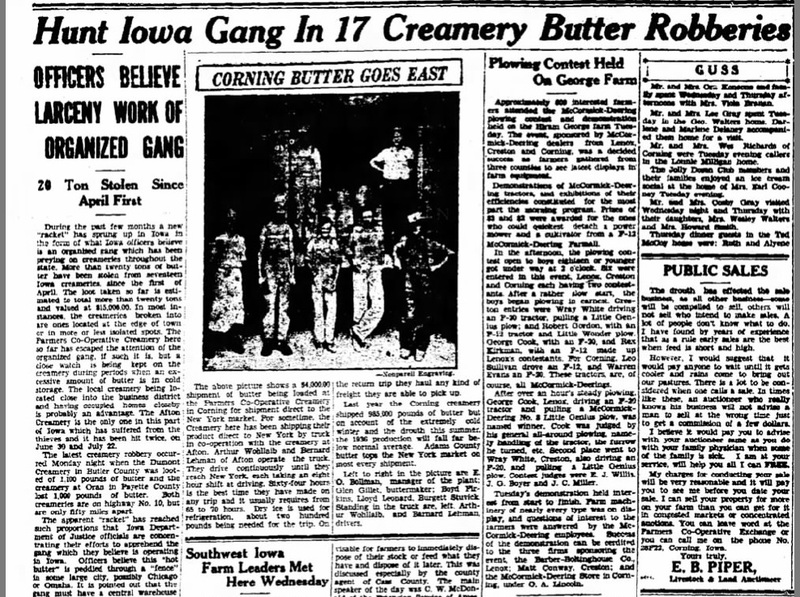 “Capture of the Butter Gang was the climax of one of the greatest Iowa manhunts in recent years,” officials told the newspaper. The story wasn’t over, though. Less than five years later, one of the original butter gang members tried to revive the scheme. Under the headline “Butter Theft Gang Thwarted,” the Jan. 15, 1941, issue of the Mason City Globe-Gazette reported the arrest of Bryon Green, 32, of Sioux City. “R.W. Nebergall, chief of the Iowa Bureau of Investigation, believed that Green was attempting to set up a new ‘butter theft gang’ in Iowa,” stated the article. On Dec. 13, 1940, Green had been released from prison in Stillwater, Minnesota, after serving three and a half years for burglary. Within a few weeks of his release from prison, Green was arrested by Chicago police, who accused him of entering the Masonville, Iowa, creamery on January 9, 1941, and shipping 1,230 pounds of stolen butter to a Chicago firm. Thus ended the saga of the infamous butter gangs that terrorized rural Iowa in the 1930s. Their nearly forgotten story faded into history, along with the small-town creameries that once inspired their notorious crime spree. 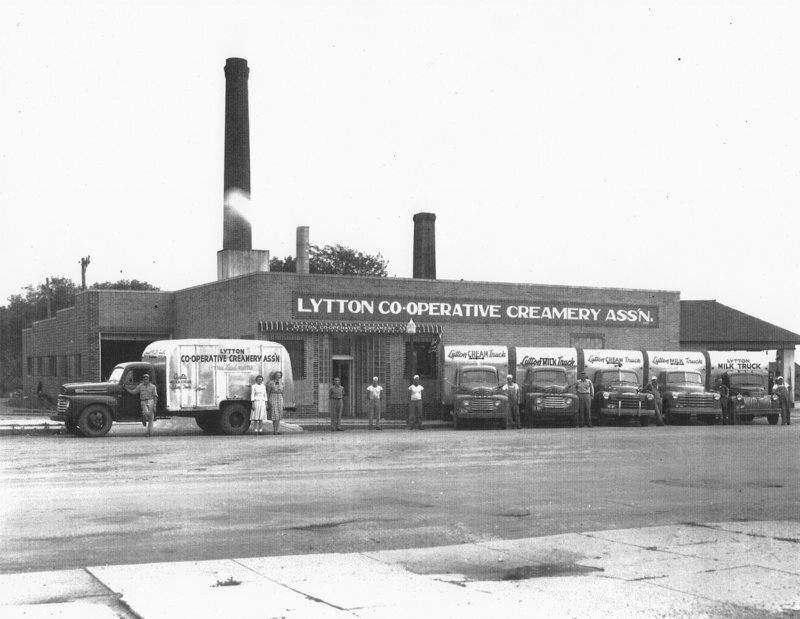 The Lytton Cooperative Creamery Association (featured in my Calhoun County book) was organized in June 1933. Capital for the new venture came from local farmers, who subscribed for shares on a basis of $5 per cow. In 1936, the creamery produced 110,000 pounds of butter. Grade A milk was processed, bottled, and distributed under the name “Lytton Maid” until this was discontinued in 1963. The plant closed in August 1979.